The struggle to find ethical ways to pursue profits has been going on for over 220 years. Rodney North’s story on this site mentions a campaign Equal Exchange joined a decade ago to find alternative sources of cocoa, after the media reported that a lot of cocoa from West Africa was produced by slaves and child laborers. Members of the Religious Society of Friends (or Quakers) had been waging this fight since before the United States existed. A Philadelphia Quaker, Anthony Benezet, founded the first anti-slavery society in the United States in 1775. By the 1790s, Quakers in England and the United States had organized the free produce movement to boycott goods produced with slave labor. The illustration above comes from a pamphlet issued in England about 1825 and reproduced online by The Abolition Project. The struggles continued into the 19th and early 20th Centuries as the Cadbury brothers and other Quaker businessmen lobbied their government and peers to avoid slave-produced cocoa and other products (for details, see Deborah Cadbury’s 2010 book, Chocolate Wars). 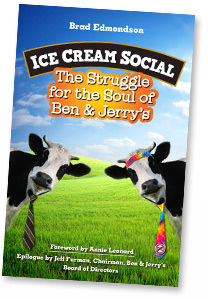 In the 1980s and 1990s, Ben & Jerry’s broke new ground as it struggled to grow and satisfy shareholders without abandoning the founders’ passion for social activism. They helped start a movement that is now in its second generation, with the number of Benefit Corporations at 900 and counting. The long history of campaigns against slave labor, and the fact that slavery still exists, shows that it often takes more than one lifetime to achieve social justice goals. Hopefully Ice Cream Social will be the first volume of another long story, one that’s still unfolding.